Description: US #73 on circular rate cover unknown postmark with matching fancy propeller in circle cancel sent to Johnstown, Ohio. Description: US 3 cent pink entire postmarked NEW - YORK, JUN 27 with matching fancy cookie cutter star cancel sent to Rondout, NY. 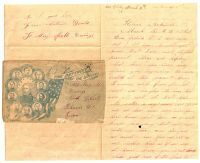 Description: Stampless folded letter postmarked CHARLNS, CA., APR 10 with manuscript "20" rate sent to Scotts Neck, Pocotaligo, So. Carolina pr. Mail. Description: Stampless folded letter postmarked red CHARLESTON, S.C., NOV 27/10 rate sent to numbered street address No. 28 Platt St., New York. Description: Stampless folded letter postmarked red MOBILE, Ala., with matching WAY 11 in circle sent to Boston. 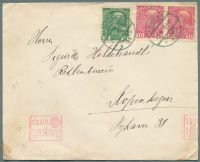 Description: Stampless folded letter postmarked SAVAN., G., APR 2 with manuscript "50" rate sen to Philadelphia. Description: Stampless 3 page folded letter postmarked CHARLNS, CA., JUL 7 with manuscript "25" rate sent to Dublin, New Hampshire. Description: Stampless folded letter postmarked CHALSN, S.C., JUL 12 with manuscript "37 1/2" war rate to Philadelphia. Description: Stampless folded 2 page letter postmarked red CHARLESTON, S.C., NOV 24 with matching PAID 5 sent to Columbia, So. Carolina. Description: Stampless folded letter from William Burgoyne postmarked CHARLNS, CA., JUN 16 with manuscript "37 1/2" war rate sento to Philadelphia. 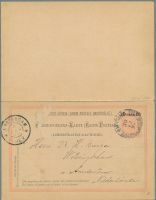 Description: US #113 cork cancelled on circular rate cover sent to Eagle Creek, Ogn. Flap not sealed on verso. Description: Stampless folded 3 page letter postmarked CHALSN, S.C., APR 15 with manuscript "25" rate sent to Baltimore.